I had a friend spectating this game who had to stop watching after Miss Fortune got her third triple kill while still in the laning phase. At one point this Miss Fortune was 16-1, having the game of her League career. With her team on her back they soared to a commanding 13-27 team kill lead. However, our team never once tried to surrender. I was having a splendid time top. I survived a level 2 Nautilus gank. Well, more than survived it. I actually killed Shen for first blood while Nautilus came to his rescue. Then, with only ~150 HP left on me, Nautilus had to turn and run or face the fury of my pushing creep wave. That little bit of snowball actually helped me beat Shen in the lane. I refused to leave top. It was my sanctuary. It was my method of victory. I knew that I couldn’t beat Miss Fortune now that she was this far ahead and running cleanse for my blind. I knew that I had to win unconventionally. Shen would ult away from top to a team fight happening somewhere else on the map. I would immediately drop a shroom to push the lane and rush to his turret. I could beat anyone on their team 1v1 as long as their name wasn’t Miss Fortune. In a wild attempt I mapped my way through their top jungle with mushrooms, waited for their team to show, and backdoored the inhibitor turret. It had about three auto attacks worth health left on it, so it went down quickly. However, it sealed my doom. Nautilus and Miss Fortune emerged from the jungle, enraged by the inherent global taunt that I possess. However, it was too late. The damage was done. The inhibitor was exposed. Now, with LichBane and 500 Ability Power I had the ability to take their inhibitor if they left it alone for more than 10 seconds. I bought a couple wards and placed them in popular jungle exits so my team wouldn’t get flanked by the much stronger adversary. I moved only through the jungle, shrooming where I knew people would walk. Miss Fortune had Guardian Angel and oracles elixir, so I couldn’t rely on my passive to hide from her anymore. I told my team that I was going on a suicide mission, so they should apply pressure elsewhere. I knew that we couldn’t win a team fight for dragon, especially if I wasn’t there and didn’t have mushrooms in place. However, with dragon coming up at 43:20, if I timed my inhibitor kill correctly I could pull the attention of the other team to allow my team enough time. And then Tristana died for no reason. Welp, screw it. I come out of stealth and step around the corner. I time my LichBane procs with my Q, W, and R. I take it down much faster than I had anticipated, so I step up to the tree in the enemy’s base and recall. I show up to the back end of a team fight. 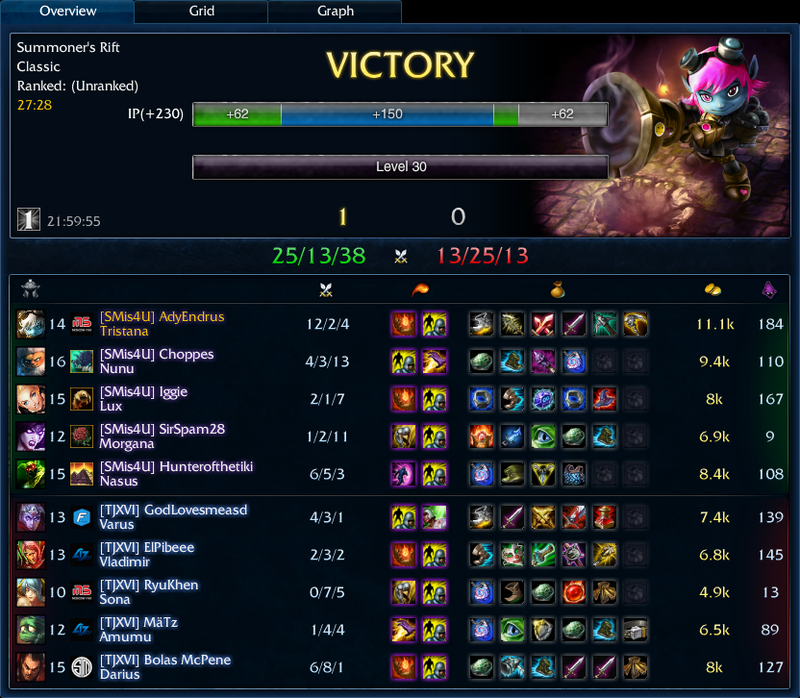 We manage to take down Orianna and Miss Fortune and only trade another Tristana corpse for it. With super creeps pushing top I survey bottom lane to see if it’s viable to push. I see that my team can’t win a fight without me, but more importantly the other team sees that my team can’t win a team fight. It was at this point that my post got it’s title. Nunu, on the other team, says in all-chat “Teemo” so I politely reply “Hi guy” and he comes back with “it’s not cute anymore.” He was either referencing the mushrooms covering the map that he took the privilege of walking over, or my constant pressure on his top lane. They begin to gather mid, but before they can I come out from behind Orianna and take full advantage of my Deathfire Grasp, melting her health bar and watching her wastefully try to ult me. I wanted to say “Was that cute enough for you?” but I didn’t want to void my chance at getting honor this game! With the bunny rabbit Teemo skin I definitely looked cute. Then something miraculous happened. The stars aligned. I was in their top jungle (where Teemo lives). I had ward coverage, I had mushrooms. I saw the enemy team mid and my minion wave gathering top. One, two, three mid. Four mid. Five mid. Teemo time. I sprint into the enemy base and shroom the full creep wave. It’s gone, and my super minions are on my tail. I let them tank as I watch my LichBane timer. Ok, get both Nexus turrets and get out. Just need to get these turrets and get out. I can do this. First turret drops. I am killing the second turret, expecting to see the enemy team show up any second. However, they had decided to dive my team at our inhibitor turret in mid at the exact same time. They were in no position to back out. Their second Nexus turret falls. I panic. I start to attack the Nexus. My heart starts to race. I can just picture Nautilus popping out and ulting me and Miss Fortune ending my wonderful run through their base. Instead a wild Shen appears. He flashes (literally) into view, gets as close as he can through minions and taunts at me. I flash to avoid the taunt, and drop a mushroom to give me another LichBane proc and continue working on the Nexus. He exhausts me and hits his Randuins. It literally felt like I was getting 0 attacks per second. Then I saw the “gg”s showing up in all-chat. The other team realized that Shen couldn’t hurt me, had already missed his taunt and blew his exhaust and they weren’t going to get back in time. The game was over. The Nexus was exploding, and neither team could believe it. Does it look like I was trying to be cute? Despite dominating bot lane and our mid going Legendary, when the game went late the other team was winning team fights. I was forced to avoid Blitz hooks, Lee Sin Qs, and Jax leaps while staying out of Tristana’s auto attack range. It was miserable. No one was peeling for me. To make matters worse my Diana from mid tried to dive 1v5 after the other team had just won a team fight. The surrender votes started to come. The first one was more of a wake-up call for us, because we had been ahead the whole game. I was on Skype with Obscene Tangerin, our Nocturne, and he asked me “are we surrendering?” and I replied with “definitely not.” Surrender vote failed 3-2. The game goes on, we have a team fight near river. Our team splits. I have Blitz and Jax come for me. This time Nunu sticks around to peel them off me. He even ults to disrupt them. This gives me the time I need to cut them down. I drop Jax, finish off Blitz and kill the Lee Sin as he comes over to fight. I start to get excited, but then I see Vlad and Trist. How can Vlad and Trist be here? They should have been fighting the rest of my team! The two of them finish me off as I hear the announcer say “Quadra kill!” Not for me. For Tristana. My team let that worthless Trist who got outplayed in bot lane back into the game. They let her stack four kills right in a row. They let her sit in the back and just poke away at them. I was quite worried about where this game was going. After we re-spawn we’re still pressuring Baron. We catch a glimpse of Lee Sin in bot lane so we go to town on Baron. Baron is getting low, but the other team has a ward over the wall. I see Jax waiting to jump in to steal it. I know we have smite and the enemy doesn’t. Just as Baron is about to go down Jax comes over the wall. I’m not worried because there are 5 of us and 1 of him. However, Blitz trades Jax for Nocturne as Noc goes flying over the wall from a Blitz grab. I finish off Baron, Arcane Shift over the wall (after Jax flashed out) and finish him off. Blitz runs to me so I kill him too. Double kill. Vlad and Trist come to fight just by the purple side’s lizard buff. I’m able to melt Vlad and picked up my last kill on Lee Sin as he showed up late to the party. With my team mates left we take some mid turrets and are forced to back. I pick up the enemy blue buff and Dragon on my way home. By this point we had already failed three surrender votes, but now we have hope. Special thanks to lolking.net for the image. I accidentally saved over the after-game picture, so this will have to do. Graves isn’t new, I’m new to Graves. I unlocked him the day I played this game, so 9/25/2012. However, I have multiple ranked wins with Graves. He used to be my favorite AD carry. I loved harassing with his Q, dodging with E, and shutting down strategy with his W. The burst from Q and R are scary enough to win trades bot lane. His E lets him abuse lanes and has almost no cooldown with a friendly jungle Nunu and Phantom Dancer. This happened to be extremely convient, because I had both! 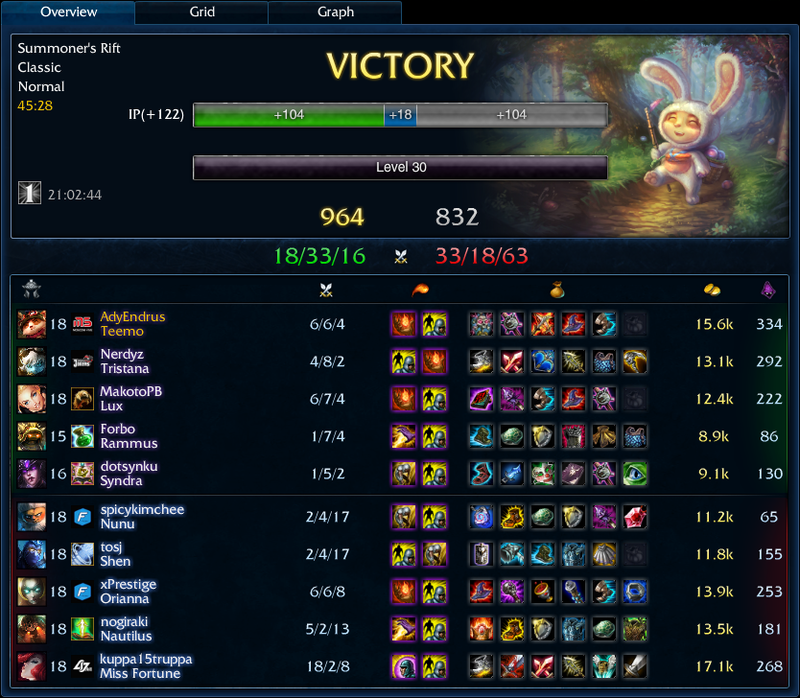 We dominated bot lane by baiting both of Trist’s summoners. Once she didn’t have ignite or heal, we knew she wouldn’t have flash. It was nubehound’s first time on Taric, but he did a great job knowing when to stun and when to run. Tying for fewest deaths in your first game as a champion is pretty admirable. 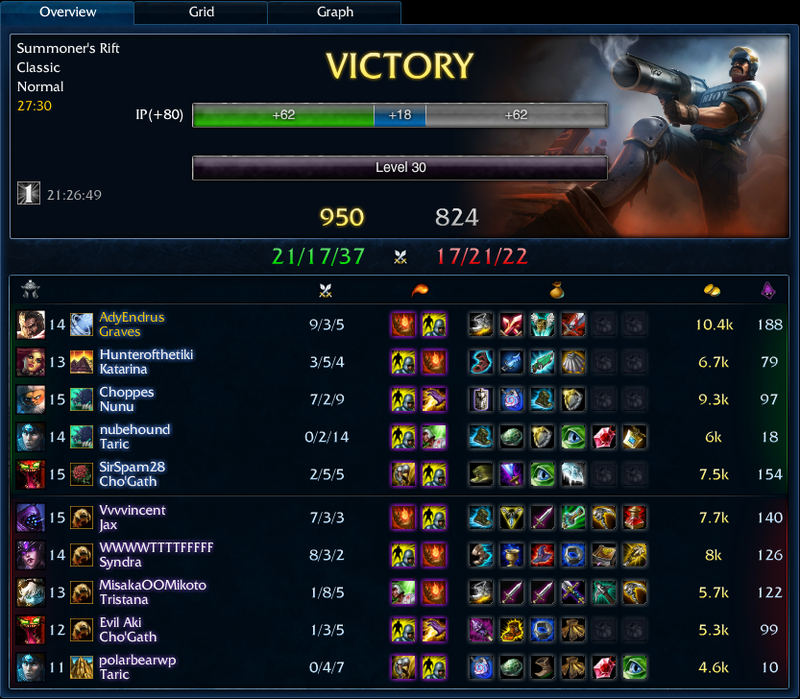 Also, I told him to max W first, and I don’t think the enemy Taric followed suit. This gave us a huge armor advantage in the bot lane, combining Grave’s passive with Taric’s passive made us a bursty, tanky bot lane combo. Tristana’s magic damage from her E was still quite effective without extra MR, but I knew that if things got ugly and she jumped, used E, and ignited me, that I could just flash away and it would be k. After I was 7-1 we decided to wander to mid lane to find other stuff to kill. The other team’s top and mid were doing very well. We were in a stand-off mid, and were afraid of getting poked down by Syndra and Cho. I had just gone back to finish my Phantom Dancer and said “I wish we could get to that Syndra.” Nubehound, not understanding the dangers of a fed mid, said, “Here, she’s stunned” and proceeded to stop forward and just dropped a stun on Syndra. I unloaded everything. I’m assuming my team did the same. Syndra melted and was nothing but a greasy spot on the road. A team fight broke out where we aced in exchange for our Cho’Gath (if I remember correctly). It seemed like a fair trade. We shoved so hard mid that the game was basically over. The enemy team just stuck around to let me get my Guardian Angel, then they gave up.